In the Hunter laboratory, we try to better understand the ecology and evolution of interactions between microbial symbionts and their insect hosts. We are currently studying the mechanisms of reproductive manipulation of Encarsia parasitoids by the symbiont Cardinium, the symbionts of cochineal scales and their coccinellid predators, and the transmission and fitness consequences of the environmentally-acquired Burkholderia on the bugs such as the coreid Leptoglossus zonatus, and the omnivorous stilt bug Jalysus wickhami. We are also concluding (maybe?) 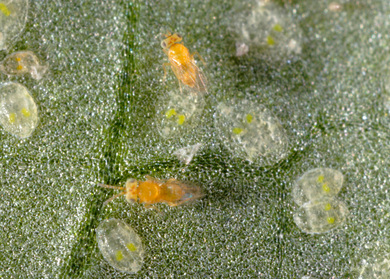 more than a decade of study on the population ecology of the symbiont Rickettsia in the whitefly, Bemisia tabaci. Molly Hunter is also the Chair of the Graduate Interdisciplinary Program in Entomology & Insect Science. If you are interested in graduate study in the Hunter laboratory, contact Molly Hunter (see contact page), and check out what the EIS graduate program has to offer. Click on the beetle icon on the left to take you to the GIDP-EIS home page where you can find out more about the program. Summer 2018. Phew - its been a long time since an update! Since I last wrote, three of our amazing grad students graduated (See Lab alumni page), including Dr. Corinne Stouthamer and Master Liz Bondy and Jimmy Conway. Also two of our wonderful undergrads (both Microbiology majors, both involved in research projects in the lab) graduated. This photo was taken at Gentle Ben's where we took them out to celebrate. They are Matt Flores (checked shirt, arms crossed) and Sam McMasters (pink shirt, next to Matt). Matt is off to start a Phd program at Virginia Tech, and Sam is going to start a Med Tech program at UA. Shown L to R are Suzanne Kelly, lab manager, Matt Doremus, PhD student, Matt Flores, Sam McMasters, Ashley LIttle, undergrad and Molly Hunter. 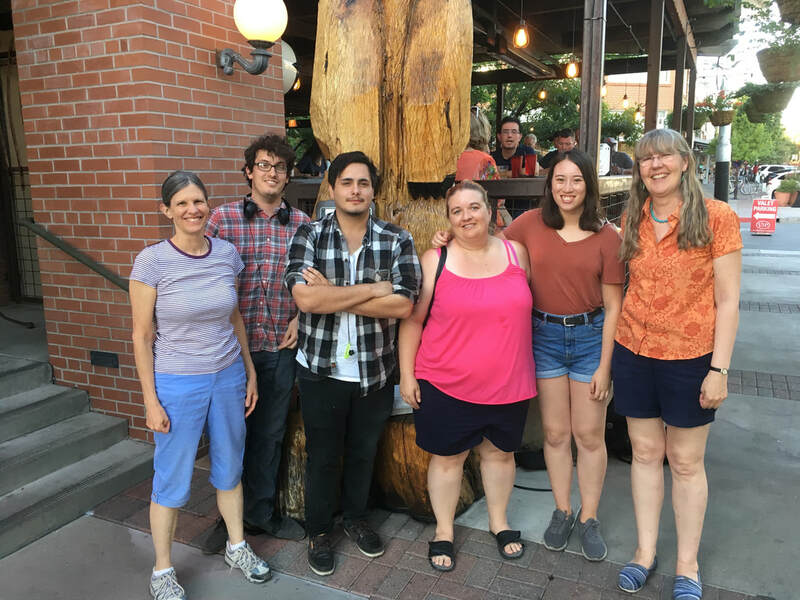 Missing are postdocs Alison Bockoven and Alison Ravenscraft, PhD student Jessica Vogt, undergrad Francisco Montijo and greenhouse technician Josh Garcia.